Promotional CD containing only the original tracks. Live recorded in Verona, Rome, London, Tokyo, Budapest. Music composed arranged and conducted by Ennio Morricone. The orchestrations are the same as in the Original Soundtracks. DVD Side: Entire album in Dolby Surround 5.1, DTS and PCM Stereo. 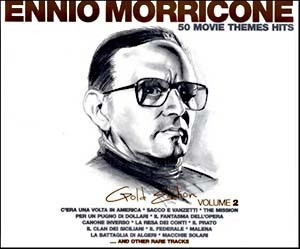 Also includes an Ennio Morricone video interview \'My Life, my Music, by Giovanni Morricone, a 25 minutes documentary including interviews, storytelling, photos, and excerpts from concerts held in some of the world\'s greatest music temples. DVD Side Total Time: 90\'. Including a 12 pages color booklet + 4 pages insert about DUAL DISC specifications. CD with DVD. Including 2 extra tracks. Dual disc: 1 side CD, other side DVD. 21. Exclusive Video Footage"Yo-Yo Ma plays Ennio Morricone"